I needed to get back on the horse after the drama of the 1701D poster. My first Poster with SciPubTech was going to be Deep Space Nine which was challenging given the size of the subject. One of the first unfortunate lessons working on this poster was the disappointing reality that for the first time in Star Trek history the scale of things were being skewed ala something I like to call the Jupiter 2 syndrome. The Jupiter 2 was the ship from lost in Space which we all love but whos insides never fit the outside of the ship. This was disappointing to me as I got some early feedback from Paramount that our original concept sketch was out of scale to what they were showing on TV. Now I had taken all the blue prints the studio had provided and worked out the scale and perspective. 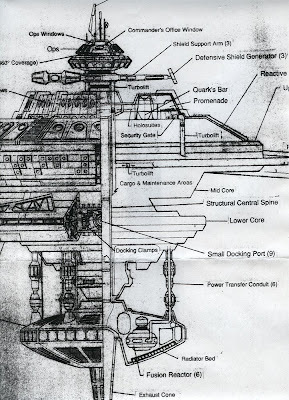 As you can see in the drawing below the docked Enterprise D appears quite large relative to DS9. 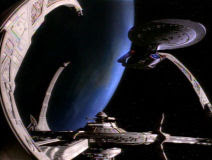 As you can see in the image from the show the Enterprise D is 30% of it true size. When I asked about this discrepancy the answer I got was a tacit acknowledgment of the truth but that they wanted DS9 to look immense and to do so was allowable under creative license. Disappointed I moved on! 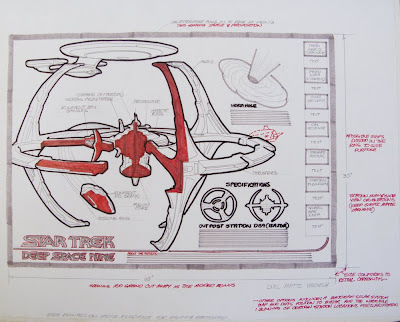 Unlike the previous two projects, with DS9 I received very specific blueprints and floor plans directly from Paramount which made the job of creating the drawings so much easier in many ways. 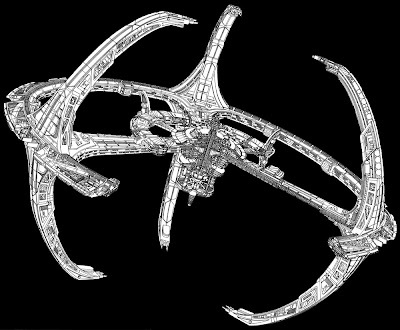 There was a lot about DS9 that was unexplored and unseen which allowed me to create it for the first time. How was the station powered, where was it's computer core... these were all laid out for me in black and white but the rest was mine! 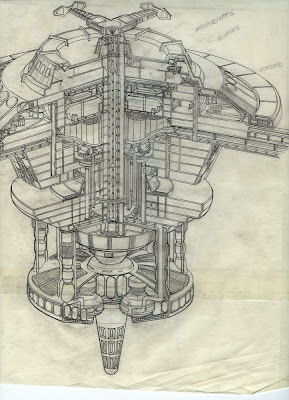 The first drawing was to create the core of the station. I was never truly able to draw the entire station on one piece of paper... with the deck height a mere .25inches the final drawing would have been the size of a wall. The core image below is nearly 30 inches in height when completed. Once all of the conduits and turbo shafts were laid out I was able to start filling in the decks with all matter of quarters and labs. After drawing all of the separate sections of the station the ink drawings were created using different pen sizes so that when some sections were reduced the line quality would match the other sections flawlessly once combined. 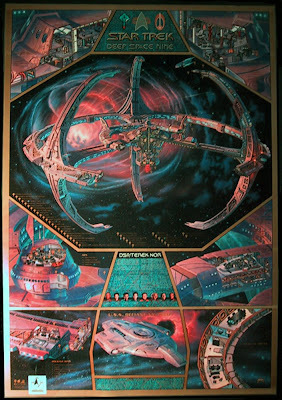 Another fascinating aspect of this poster was that the station itself was of Cardasian design..Alien to most Starfleet designs and there for more interesting a project creatively. At one point there was going to be a fairly large secondary cutaway of the Rio Grande, one of the 3 Runabouts on the station. 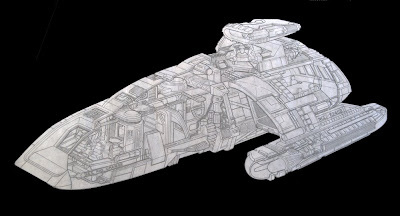 The drawing below is the final line work of that ship with all of the detail corrected to Paramount's approval. 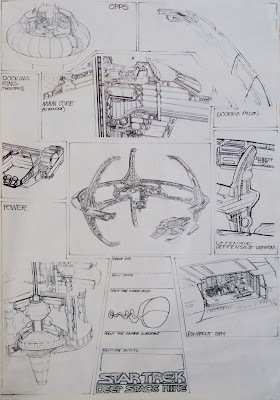 The final use was scaled down considerably showing the Runabout secured in one of the DS9 landing bays... the detail was all but lost in that version. Desiding on the format of a poster is not at all easy. It was clear that we could not have the poster as originally conceived as it would have been to large and expensive to print. Breaking sections down and showing them enlarged was the key to the posters design... the first draft of that idea is seen below. The design was modified later to look more like a Cardasian computer display which was taken one step further when we added the copper metallic ink used to frame the individual illustrations. Again Bob Kayganich was tapped to complete color work and his color scheme was simply amazing as he not only captured the brilliant lighting of the open wormhole but also the refection of that lighting on the hull of the station... its a subtle yet fantastic example of his talent. As the poster neared completion a new season of the show had begun and the addition of the Defiant. I lobbied pretty hard to get a cutaway of the defiant on the poster, but timing would have put the poster off for atleast 4 months and so we added an exterior illustration which fit the bill. The finished product was stunning and we made a more formal debut of the poster at the 30th Anniversary celebration at the Manned Space Flight Centre in Huntsville Alabama where NASA and Paramount put on a 3 day extravaganza to celebrate the milestone. During that show we were able to give copies of the poster to several of the stars of the show but the biggest honor came when we met Joel Williamson the lead NASA engineer for the International Space Station who purchased a Deep Space Nine Poster signed to the space station team. The poster was launched with the station in March of 1997. Now I don't know about you but having one of your drawings hanging in the Smithsonian was a hard act to top but I think this took the cake! wow, the stations looks incredible, is there any chance to get hold on a copy?